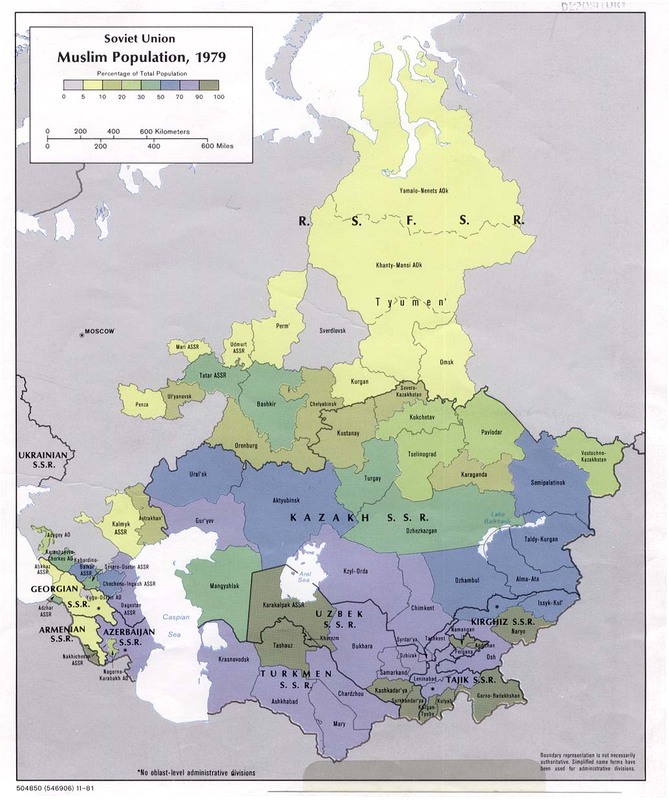 From an earlier release of Joint Publications Research Service (JPRS) Reports, 1957-1994, we recently highlighted five reports concerning religion and atheism in the USSR in the 1960s. The September 2014 release of JPRS also includes translations from the Soviet Union on this same broad topic with particular attention paid to Islam. 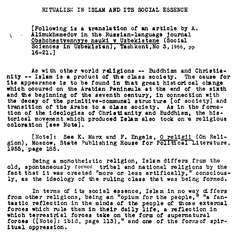 …like other religions, has always played a reactionary role, being in the hands of the exploiting classes a weapon of spiritual oppression of the workers. 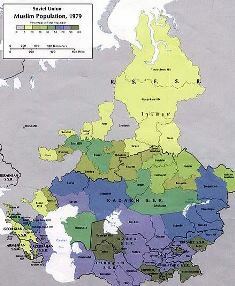 It was used by foreign colonizers for the enslavement of the peoples of the East. In the USSR, as a result of the victory of Socialism and the elimination of exploiter classes, the social roots of I. [Islam], like those of any religion, are destroyed. In USSR I. exists only as a survival of one of the forms of ideology of exploiter society. …when it is precisely this side of Moslem religion which is advanced by its ideologists as the main and basic (but often the only) ideological reference-point on the road to the independent development of ‘Moslem’ countries. 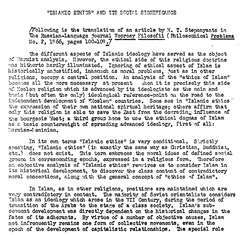 Some see in ‘Islamic ethics’ the expression of their own national spiritual heritage; others affirm that only this religion is able to save the East from the degrading influence of the bourgeois West; a third group hope to use the ethical dogmas of Islam as a basic counterweight of spreading advanced ideology, first of all: Marxism-Leninism. For the first time in the history of mankind, Socialism, having eliminated the social roots of religion and having undermined its influence upon the masses, is creating all the conditions for a final liberation of toilers from the religious narcotic and for a full dying-off of religion. God reminds of that old, useless and constraining furniture which, however, is being passed down from hands to hands in the family and is being reverently preserved because the son obtained it from the father and the father from the grandfather. 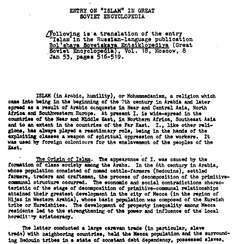 This publication includes two articles reprinted from the Russian-language periodical Nauka i Religiya (Science and Religion). The first describes the challenge of “Atheism Being Inculcated Upon the Women of the Derbent ‘Magals’” which were the ancient quarters of the city of Derbent in Dagestan. A team of volunteer women atheists organized and began intensive outreach work among the Moslem women believers. This article was written after the group had three years of experience which has been successful in leading the believers away from the mosque and ritual. In the interests of the exploiters the Koran instructs believers to satisfy themselves with their lot and to remember that social inequality is the work of the hands of God himself. 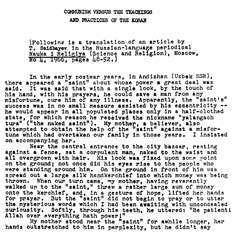 This publication includes five articles translated from the same periodical, Nauka i Religiya, referenced above. 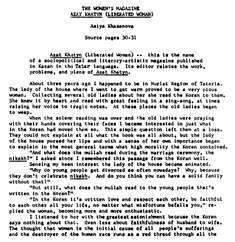 The titles of the articles include “Older than Islam,” “Betrayal of Holiness,” and “Poet, Scholar, Freethinker.” In a lively essay entitled “The Women's Magazine Azat Khatyn (Liberated Woman),” the writer is angered by the treatment of women within Islam and as they are referred to in the Koran. She engages in a debate with an elderly woman about marriage, a pious Moslem who tells her that “In the Koran it's written love and respect each other, be faithful to each other all your life...” The author reports, "I listened in astonishment because the Koran says nothing about that...the thought that woman is the initial cause of all people's sufferings and the destroyer of the human race runs as a red thread through all the ‘sacred writings.’ And in Islam it finds its crassest embodiment.” She enlarges on this conversation in order to describe how daunting, and how necessary, the campaign to bring these other women to atheism is.